Each semester, approximately 150 foreign exchange students from 24 countries participate in an exchange program at the University of Seoul (UOS). They choose to come and study in UOS, and they want to closely learn about Korean culture and language. 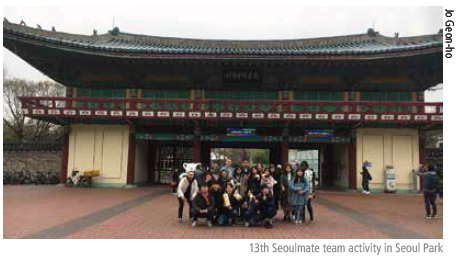 To meet the needs of these foreign exchange students and help them integrate into Korea and campus life, the IICE (Institute of International Cooperation and Education) has established a buddy program called “Seoul Mate”. The program helps create solid friendships between exchange students and UOS students through dynamic activities in Korea. 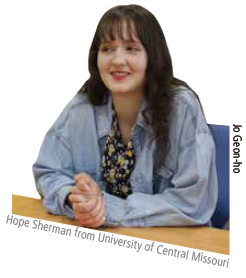 The UOS Times interviewed two members of the 13th Seoul Mate program in order to know more about its activities. What motivated you to apply for Seoul Mate? Before I returned to university, I was thinking of what I would like to learn and do this semester. One of my thoughts was that I wanted to meet people from various nations by communicating in English and learning about their culture. In the meantime, one of my friends introduced me to Seoul Mate. Of course, there were various programs that allowed me to interact with foreigners, but I chose to apply to the Seoul Mate program because it allowed me to meet more people from various countries than any other program provided by UOS, and I was also attracted because this program offered a natural way to meet them. What activities do you remember in Seoul Mate? Two activities are the most memorable for me. The first one was a welcoming party and the second was kayaking in the Han River at sunset. Regarding the welcoming party, it was the one of main activity in Seoul Mate because it was the first time both Korean and foreign people met each other. At the party, we were introduced to each other and played team games. The mood of the party was fun and active. I had never talked that much to foreigners in such a short time. 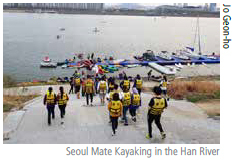 The other activity was kayaking in the Han River last April. Our team knew that many exchange students liked to see the night skyline of Seoul, so our team tried to find the best way to enjoy it. We discovered that there is a Kayaking service in the Han River at night. It was spectacular. The scene of the sunset and night view of Seoul was so splendid that all of us could not stop taking photos. I was so pleased that I helped my friends experience this magnificent view. What was your proudest moment in Seoul Mate? I have been giving my exchange friends Korean lessons twice a month since last March. They take Korean classes in school, but I think there are daily expressions and words that cannot be learned from books. So, I have focused on teaching them daily expressions, buzzwords and internet words. One day, I saw my friends naturally speaking an expression I taught. This showed me that I made a good choice when I applied to Seoul Mate, and it motivated me to prepare my Korean lessons even better. Why did you choose to participate in the UOS exchange student program? I have been interested in Korea and its culture for a long time, so I chose to participate in the program last year. When I came to Korea for the first time, I remember that I liked being here even more than I expected. I met a lot of friends and had a really good time through Seoul Mate. When I went back to America, I wanted to come back to Korea again. So now I am here attending one more semester in UOS. Though it was in another semester, we went camping outside of Seoul. Up until that point I had no chance to be outside of Seoul. It was interesting to see the Korean countryside and I remember thinking that I was kind of proud of myself because I went two days without speaking any English. I also remembered when we sat around a campfire playing guitar and singing. It was really funny. Have you received any helpful information from a Seoul Mate? I was able to meet many Koreans through the Seoul Mate. When I had questions about Korean culture or the language it was nice that I could ask and my Korean buddy would explain it easily so I could understand quickly. It was also nice that I experienced a lot of places I wanted to visit through various team activities. 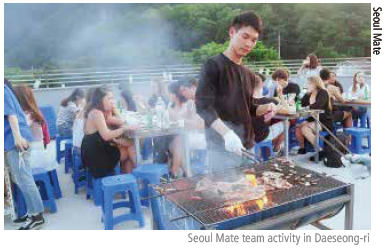 We have a buddy program similar to Seoul Mate at my school in the U.S., but I think Seoul Mate seems to be better because there are more activities and more opportunities to get together. Although The UOS Times interviewed only two members of Seoul Mate, Park and Hope explained the program so well so that we were able to understand what Seoul Mate is and what they do. UOS has made a step forward to globalization through the Seoul Mate program.